We are over a month into the new year! For some financial advisors, the new year can mean continuing upon their success by converting prospects into clients, while, for others, the new year may be a fresh start after an overwhelming, stressful, and tough year. With this new start, many advisors create resolutions and goals they want to conquer this new year. While every financial advisor and planner has different goals and resolutions, one goal each person in the advising business should have is improving and growing their financial practice or business. One mistake that many advisors make is thinking or believing that their profession is solely about managing clients’ money. For advisors, it’s important not to fall into that trap, as it can cause motivation to drain and make each work day a challenge. An advisor’s responsibility is not just to manage money; its’ to manage client behaviors and expectations, too. It is an advisor’s job to ensure that their clients have realistic expectations that line up with their goals. With the guidance of a financial advisor, clients are instantly better equipped to handle a volatile market and stick to the plan for the long run. It’s easy to tell people things they want to hear, but in the financial industry, doing that can come back and negatively affect an advisor’s ability to expand their business. It is important for advisors to clearly define what their role is when they bring in new clients. Advisors should avoid promising clients that they can make them extremely rich by managing their investments carefully. They should avoid telling clients they will ensure they reach their financial goals, no matter what they are. They should steer clear of guaranteeing a comfortable, enjoyable retirement, or the ability to knock out a child’s education bill. Advisors who are making promises they are unsure they can keep are putting their practice at harm. Overpromising leads to higher client expectations, which will cause conflict when certain promises are not kept. The financial industry is competitive. There are plenty of advisors trying to earn a prospect’s business. And, it is common for certain advisors to have more success than others that are serving the same target or niche market. Advisors who get trapped in the mindset of thinking that their competitors are more successful or better at what they do may eventually find themselves in entering a downward spiral. It will be more of a challenge to add new clients and retain existing ones. Of course, there will be some advisors who hold certain advantages over others, but they gained those advantages by focusing on themselves and their clients instead of constantly focusing on the competition around them. Advisors who unfavorably compare themselves to others in the field should rather focus on what traits led them to success, and aim to follow a similar method. Adding a new client to the book is a big deal. If advisors want to keep clients long-term they must allow enough time to do so and look after them. Clients who have a lack of communication with their financial advisor tend to feel distressed and may look for other financial service providers. And one thing is for sure, advisors who neglect their clients and don’t keep consistent communication are far less likely to get referrals, which are essential to growing a financial practice. Many advisors are unaware that gaining a new client likely will cost them five times more than retaining an existing client, which is why it is essential for advisors to keep their clients happy. The most successful financial advisors do not prospect in the dark. Many start by identifying and targeting a specific demographic that works best for them. Many advisors choose their target demographic based on interests and lifestyle choices, while others focus on stages of life, marital status, and professions to identify their target. Without knowing who their ideal client is, advisors will be unable to differentiate themselves from their competition. For the best chances of success, financial advisors should pursue those who are a match for their services. By making an ideal client profile, advisors can aim to work with clients who fit their plan. Prospecting is the foundation of improving and growing a financial advising business. For advisors who fail to consistently introduce themselves to new people, their pipeline of prospects will eventually run dry. This is a networking task that cannot be delegated, as people need to see who exactly they will be working with. Advisors should set goals to help get a better picture of how many prospects they should pursue, and allocate enough time to meet their targets. There should be time blocked off of an advisors calendar to ensure prospecting is a priority. Everyone procrastinates at some point. But, for financial advisors, procrastination can be harmful to their practice. Its true, procrastination is a real-time thief. But with the number of high-priority tasks advisers often are faced with, procrastination can ruin their business. Advisors should be sure to complete their tasks in a timely manner, and that’s something clients will be sure to appreciate. A client is not responsible for the success of a financial practice, the advisor is. Holding yourself accountable is important when you work in the financial industry. Advisors who are not accountable will be unable to possess the self-discipline they need to become a premium advisor in their area. Those who are not prepared to own up to their mistakes will come across as a trustworthy financial advisor in the eyes of clients and prospects. Sitting back and hoping things will improve will keep advisors waiting a long time. Every advisor has fears, but its the successful advisors who overcome them. Fears can vary, whether it is a fear of rejection that is holding advisors back from prospecting, the fear of being wrong, which is why some advisors aren’t performing well, or the fear of success, which can hamper an advisors ability to take control of their practice’s future and success. No matter what the fear, the best strategy is to accept them for what they are and face them down. Being fearful and anxious can really influence an advisor’s quality of services. It is difficult for some advisors to stop talking and listen to their clients. This isn’t a skill that they teach in college courses, and if advisors are unable to learn this vital skill, their clients may soon think they are resistant to their financial needs and the advisor-client relationship will unravel. Technology has certainly impacted the profession of financial advising and planning. Both independent and registered advisors have started to rely on sophisticated investment portfolio management software that assists with creating appropriate investment and retirement plans for clients, in addition to better engaging with clients as well. Advisors who utilize this software will put themselves in a beneficial spot, as financial planning software has been known to help make the financial planning process simplified, in addition to creating more time for advisors to focus on important things, like bringing in new clients and improving and growing their business. 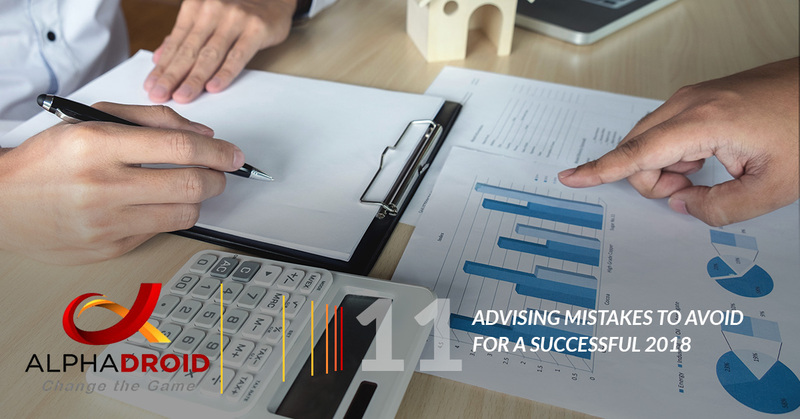 By avoiding these common mistakes, financial advisors will be on their way to improving and expanding their practice. While most of these mistakes are done from within, investing in financial planning software is in a different realm. It’s true, financial planning technology can be beneficial to financial advisors and their practice, but only if they are using an elite program. With all the software available, it can be hard for financial planners and advisors to know which to choose. For advisors looking for premium investment portfolio management software, look no further than AlphaDroid! AlphaDroid is an asset allocation software that uses sector momentum measurements to help pinpoint which portions of the market are likely to outperform near-term. Using algorithmic trading strategies, AlphaDroid helps financial advisors with analyzing, constructing, and comparing investment portfolios. The investment portfolio management software helps advisors by providing a precise and disciplined approach to productively, allowing them to catch the best days in the market and avoid the worst. For advisors who want to improve their financial practice and have more time to focus on growing it, AlphaDroid is an effective solution! To learn more about AlphaDroid and our elite investment portfolio management software, contact our team today!